Robert Christensen’s research in pediatrics focus specifically on the Hematologic Problems of the Neonate, which happens to be the title of his seminal book on neonatal hematology. Christensen studies perinatal and newborn disorders of the blood such as neutropenia, anemia and thrombocytopenia. Recently, Christensen and his colleagues described the presence of two important hormones that are normally swallowed continuously by the developing fetus and intermittently by the newborn infant. These hormones, called erythropoietin and granulocyte colony-stimulating factors, were previously known for stimulating the growth of red blood cells and white blood cells, respectively. However, Christensen’s research team discovered that both hormones are in high concentration in amniotic fluid and in human milk, and that the hormones are important, when swallowed, for the development of the gastrointestinal tract during fetal and early life. They also discovered that when a neonate is delivered prematurely and human milk is not available for ingestion, the neonate’s gastrointestinal tract undergoes atrophy, which makes feeding problematic. 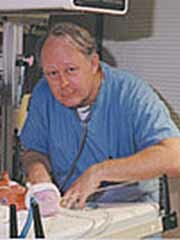 Christensen and his colleagues are currently testing the theory that feeding these preterm infants a simulated amniotic fluid solution (invented by his research team) containing the hormones that the infants would normally ingest will preserve intestinal development and facilitate the feeding of preterm infants. Christensen’s impressive research has earned continuous funding for his laboratory by the National Institutes of Health (NIH) since 1984. He is currently the principal investigator on two NIH grants, and is a program director of pediatric studies for a grant for the Clinical Research Center. Since he joined UF in 1993, Christensen has led one of the most active fellowship training programs in his department. He has also found the time to author several publications for such highly selective medical journals as the New England Journal of Medicine and the American Journal of Hematology. Additionally, Christensen has authored 128 articles and 48 book chapters, and has eight papers and a book pending.